A former ranking Malaysian diplomat has asserted that his country should shut down its embassy in Pyongyang as a countermeasure against North Korea's alleged assassination of Kim Jong-nam, a half brother of the North's leader Kim Jong-un, a US broadcaster reported Monday. The Pyongyang-based Malaysian mission which is virtually of no use should be surely closed as a strong message to the North that the acts it is now conducting can never be accepted, Dennis Ignatius was quoted as saying in a phone interview with Voice of America. Ignatius had served as an undersecretary for European and American affairs at Malaysia's Ministry of Foreign Affairs. Ignatius said, however, that he thinks it's not necessary to go so far as to sever diplomatic ties with the North, adding that the closure itself will be a strong signal against Pyongyang. Malaysia opened diplomatic relations with the North in 1973, and set up its mission in Pyongyang in 2003. The veteran diplomat with 34 years of foreign service said he has never seen his government make a response to a foreign government so strongly like this time. The response refers to Malaysia's recent decision to kick out the North's ambassador to Kuala Lumpur Kang Chol by declaring him persona non grata. 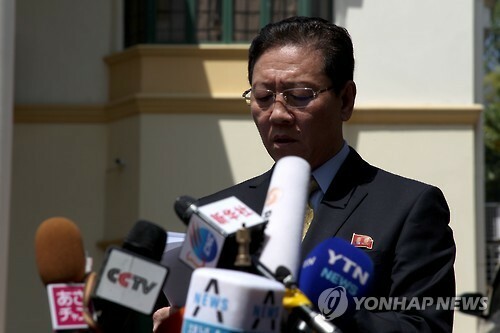 Kang has vehemently criticized that the interim outcome of a recent Malaysian probe into the assassination, whose conclusion strongly suggested the North is behind the case, is a complete manipulation in collusion with South Korea.